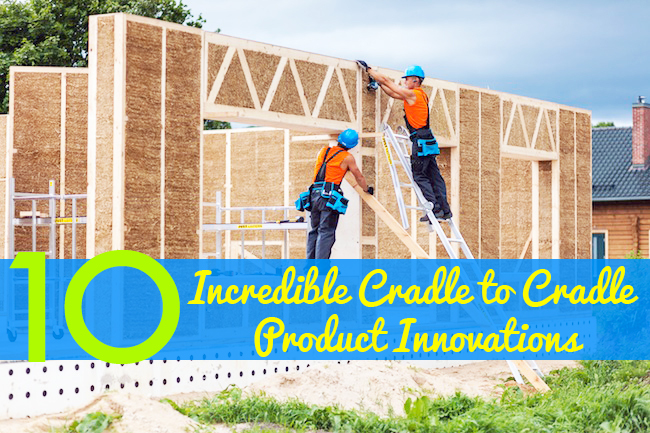 The first Cradle to Cradle Product Innovation Challenge, coordinated by the Cradle to Cradle Products Innovation Institute in partnership with Make It Right, was launched in November of 2012. By June of 2013, over 144 products were entered into the competition, which aims to challenge sustainable product manufacturers to “rethink and retool” building materials in order to follow the full cycle of sustainable and affordable product design, manufacturing, and consumption. After a highly selective screening process, only ten finalists out of the 144 entries are going on to compete for their share of the total cash prize of $250,000. The ten finalists are true industry leaders in sustainable building design production, offering alternatives to the traditional building materials such as drywall, insulation, paints, siding, roofing, and construction panels. Keep reading to learn more about each of them. The contest standards set by the Cradle to Cradle Product Innovation Challenge follow the organization’s promotion of “material health, material reutilization, renewable energy & carbon management, water stewardship, and social fairness.” Additionally, the contest requirements are also aligned with new national and international green building standards currently guiding sustainable building practices. 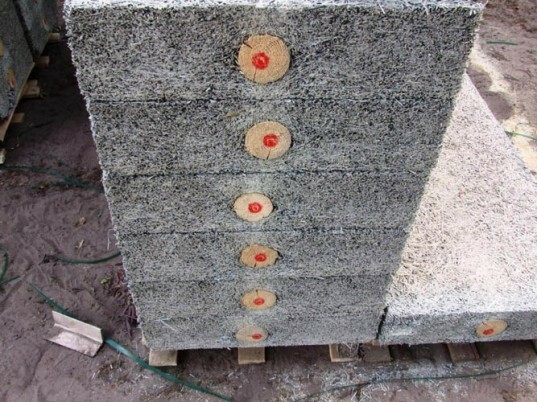 Ecovative’s mushroom insulation is a structurally rigid insulation meant to replace traditional foam insulation. As a result of a combination of agricultural byproducts and fungal mycelieum, a natural and self-assembling binder, Ecovative’s mushroom insulation fully embodies the Cradle to Cradle sustainability model by growing quality, toxin-free insulation. Softbatt’s sheep wool insulation is the new green way to insulate. Using very little energy in the manufacturing process, sheep’s wool is known for its ability to absorb pollutants, making living and working space healthier. Additionally, wool is difficult to burn and will also delay ignition of other surrounding materials. 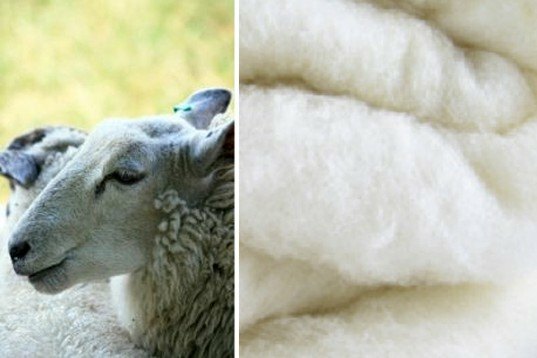 Wool may last longer than some construction and it can be easily removed and reused, repurposed, or recycled. Domus Mineral Paints are made from all natural products, improving and encouraging a healthy living and working environment. 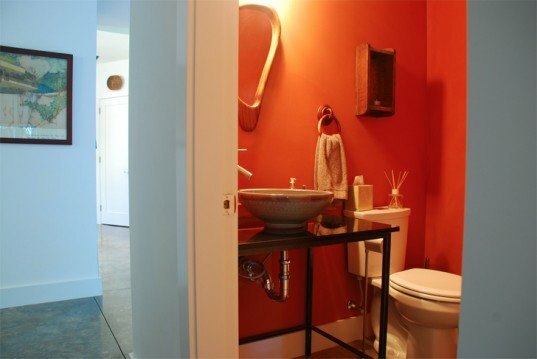 The paints are washable, toxin-free, free from asthmagens, hypoallergenic, and permeable; the paint composition prohibits bacteria growth from mold and absorbs CO2. Easy application makes for ideal use in commercial or residential areas. 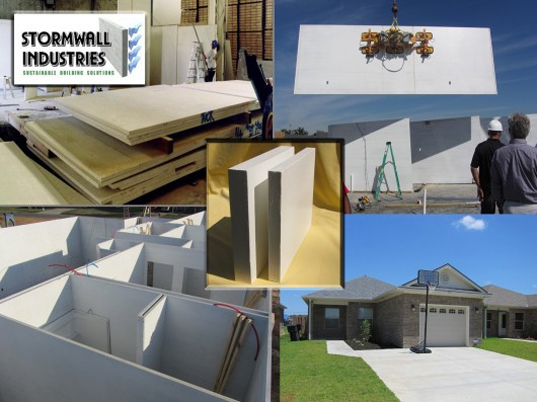 StormWall is a structural wall, floor and ceiling system with panels that replace traditional drywall. Using the Composite Panel Associates Carbon Model, StormWall panels sequester more than 3X the C0O2 emitted from the production and supply chain process. Classified E1 for indoor air quality, panels are painted in VOC-free, GREENGARD certified painter, further reducing formaldehyde emissions by 80-95%. 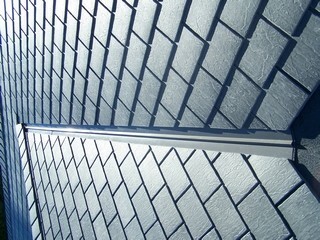 GR Green’s roofing and siding product is the world’s first truly ecological synthetic roofing and siding products. Made from waste limestone and recycled plastic (milk bottles and grocery bags), the ecological and sustainable finished product looks natural and are sold at extremely competitive prices. BioMason’s Biobrick is certainly a game changer in the world of clean brick manufacturing. 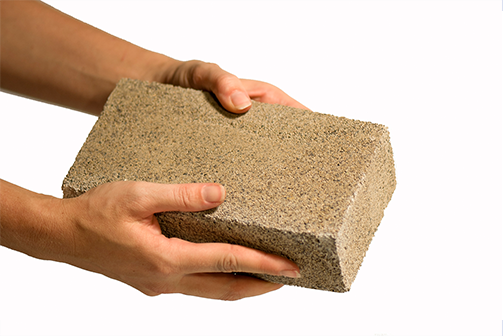 Biobrick’s technology uses bacteria to produce natural cement within a aggregate mix. 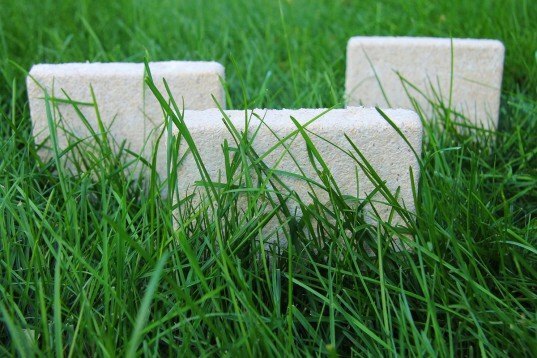 Materials used in the biobrick are globally abundant and can be extracted from waste streams. Made in ambient temperatures, the cementation process takes less than five days to form and is comparable to traditional masonry in terms of cost and quality. Ecococon’s straw panels are made from 99.4% rapidly renewable and mostly locally sourced materials (straw and wood). The result is a cost efficient and precise construction of super-insulated houses. The panels have been used in several passive house designs and are praised for their modularity, use of small-sized timber, and unique straw surface. Haploblocks are prefabricated modular building components assembled and connected on site. The materials are biodegradable and/or recyclable. The manufacturing and assembly process require little tools or energy and no water. The blocks can be disassembled and reused, further reducing energy and environmental costs while promoting social and economic equality. 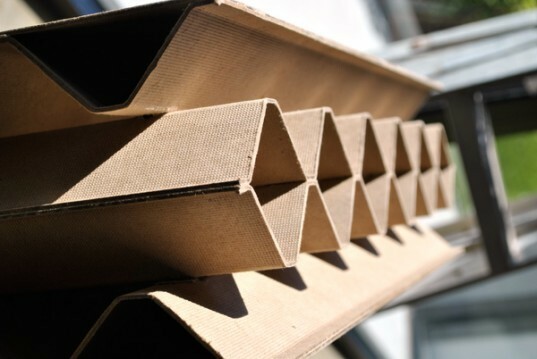 ECOR’s sustainable building panels are lightweight, low volume, and easily assembled. ECOR panels use a sustainable material technology made from a ubiquitous raw material found worldwide: waste cellulose fiber. The manufacturing process includes a closed loop water system with 99.5% reutilization cycle. DDI’s Reinforced Wood Wool Cement Board is, obviously, made from wood, wool, and cement. The wooden pole in the board is used as a constructive element that can be used for walls and roofs. The boards are free of harmful emissions as well as waterproof, sound-absorbing, and fire-, rot-, termite-, and vermin-resistant. The winners of the competition will be announced at the Institute’s Innovation Celebration in New York on November 15, 2013. These all look like great products. I love anything Cradle to Cradle does. The first Cradle to Cradle Product Innovation Challenge, coordinated by the Cradle to Cradle Products Innovation Institute in partnership with Make It Right, was launched in November of 2012. By June of 2013, over 144 products were entered into the competition, which aims to challenge sustainable product manufacturers to "rethink and retool" building materials in order to follow the full cycle of sustainable and affordable product design, manufacturing, and consumption. After a highly selective screening process, only ten finalists out of the 144 entries are going on to compete for their share of the total cash prize of $250,000. The ten finalists are true industry leaders in sustainable building design production, offering alternatives to the traditional building materials such as drywall, insulation, paints, siding, roofing, and construction panels. Keep reading to learn more about each of them.